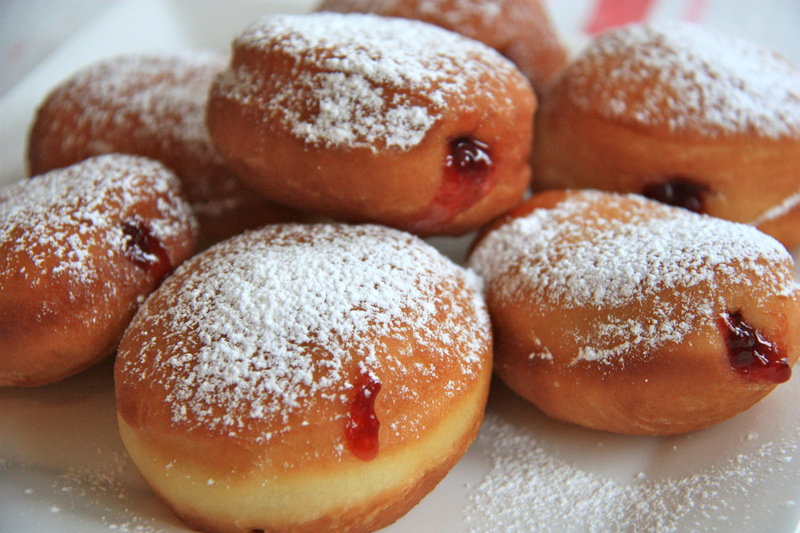 A Sufganiyot is a jelly-filled doughnut. A jewish delicacy usually served during Chanukah, it is craved all year long. These doughnuts are a welcomed party treat. Remove ball of dough and gently knead several times on a floured surface with floured hands. Round up dough into a ball and place in a medium sized bowl, greased with oil. Cover with Saran wrap and a kitchen towel, and place in a draft free spot to rise until doubled in size, approximately 1 hour. After dough has risen, take the ball of dough, which will now appear puffy and lighter, and gently deflate by kneading once or twice on a lightly floured surface. Gently roll out the dough with a floured rolling pin to a 3/4 inch thickness. Using a 1 1/2- 2 inch round cookie cutter, cut out rounds of dough and place on a cookie sheet lined with parchment paper. Cover loosely with Saran wrap and rest for an additional 20 minutes to half hour, to allow dough to rise again. Heat 2-3 inches of oil in a medium sized saucepan, or use an electric deep fryer to 375 F.
Brush excess flour off dough rounds with a pastry brush and drop 3 or 4 rounds into the oil at a time. Fry for 45-60 seconds until lightly browned on each side, flipping the doughnuts over with a small spatula or a pair of chop sticks. Be careful with the hot oil! Remove fried doughnuts to a rack to cool slightly. While still warm, roll each doughnut in granulated sugar and set aside. When doughnuts are cool enough to handle, poke a hole in the side of each one with a skewer. Fill a pastry bag, fitted with a small open round tip, with jam and gently pipe the filling until it just pops out the side of the doughnut. The sooner you eat them the better they will taste! If you are making a yeast dough for the first time it can be intimidating. It takes practice to get to know what the right dough consistency should feel like. This dough will be a bit runny and sticky to handle, that is why you need the extra flour for dusting. Even if they do not turn out perfect they will still be yummy. You will need a stand mixer for this recipe with a paddle and dough attachment.